You unzip your tent on a cool fall morning. As you step out, you have one thought: Coffee. You light up your canister stove and crank it up to full blast, but for some reason, it seems to be taking a lot longer to boil water than last evening. Is it the lack of caffeine, or is the stove really slower this morning? What’s going on? Seasoned backpackers will recognize that the pressure has dropped in their fuel canister now that it’s cooler outside. A stove’s output relies heavily on its fuel pressure, so when that pressure drops in cooler temperatures, your stove’s output naturally declines. But it’s not just cooler temps that cause this. The mere act of running your stove causes its pressure to drop. This is because fuel cools as it vaporizes, and cools the canister down. This means that each back-to-back pot of water you heat with that same canister will take longer to boil because the stove has less pressure feeding it. 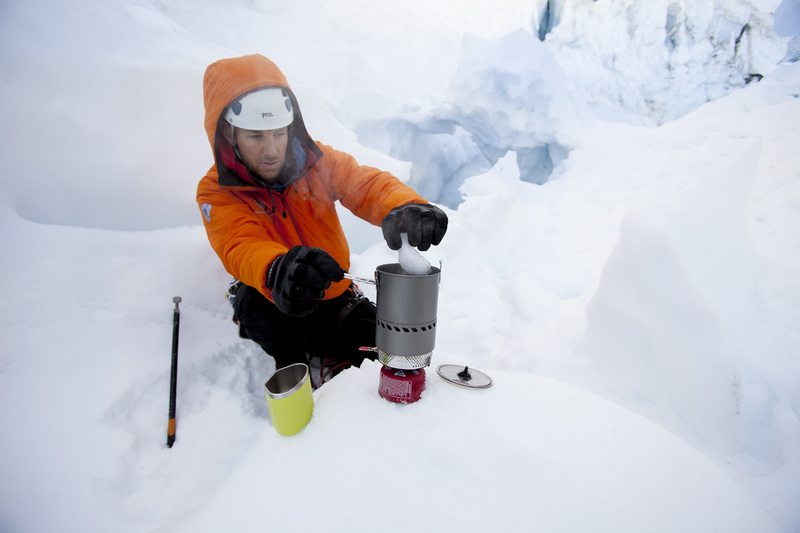 So, what makes certain canister stoves like MSR’s Reactor or WindBurner Stove Systems able to consistently deliver fast boil times across a range of conditions: from warm afternoons, to cool mornings and even into the frigid evenings of the high alpine? The answer comes down to a tiny component that’s built into these stoves. It’s called a pressure regulator. This tiny component lives inside the stove’s valve. As its name implies, it controls how much fuel pressure is fed into the stove jet. MSR stove systems are designed to operate best at precise pressure levels, and the regulator maintains those levels regardless of what’s happening externally. MSR engineers designed the Reactor and WindBurner to operate optimally at a very low pressure level. This is so that, until the pressure drops below it, the stove delivers its highest heat output most efficiently. The pressure regulator makes sure the stove is consistently receiving that precise fuel pressure level. 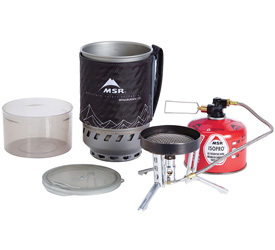 Most backpacking stoves don’t feature a pressure regulator. As their fuel pressure drops, their heat output also declines. In contrast, a stove that’s regulated offers consistent performance even as canister pressure drops. Here’s a look at the numbers: An unregulated stove is designed to deliver its max output (i.e., its fasted boil time) at 70°F. At this point, the canister pressure is 45 psi. When the temperature drops to 50°F, the pressure in the canister drops to 30 psi. As you run your stove, your canister cools further, easily dropping to 40°F and 22 psi. As it turns out, on that cool fall morning your stove may actually be putting out less than 60% of its rating. In contrast, MSR’s WindBurner and Reactor stoves are designed to run at full output at only 15 psi. The regulator ensures that the stove only receives that precise pressure regardless of the real pressure inside the canister (until it finally drops below 15). It’s only when your canister is nearly empty or the conditions are extremely cold that the pressure will finally drop below the limit of the pressure regulator and you’ll notice it in performance. All this means that with a well-regulated stove, your fourth pot of water will boil just as fast as your first, and you’ll enjoy high stove performance through a far greater range of conditions. Located inside the stove’s valve, MSR’s pressure regulators feature a tiny poppet valve. This valve is controlled by a small diaphragm that is constantly comparing the atmospheric pressure to the pressure headed toward the jet. As it reads these pressure differences, the diaphragm opens or closes the poppet valve to allow more pressure in from the canister or to cut it off. In doing so, it makes sure that the stove’s jet is always receiving the precise pressure we want it to. Are all pressure regulators created equal? 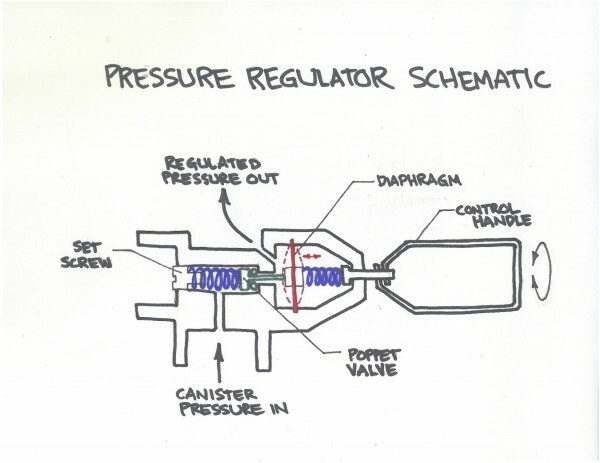 Pressure regulators are intricate pieces of technology and they’re not all engineered equally. At MSR, a substantial amount of the R&D that went into our new WindBurner stove system was dedicated to its regulator alone. The precision tolerances that are built into a quality regulator are critical and take a great deal of engineering time to achieve. That’s why only a few companies offer stoves with regulators in the first place, and why they vary in performance. 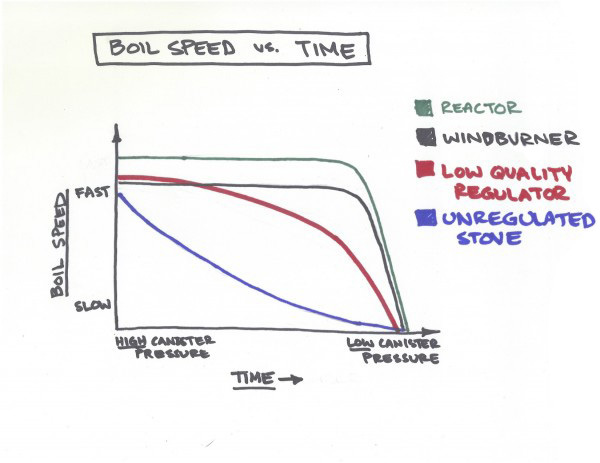 As depicted in the chart above, a stove with a well-designed regulator delivers its optimum BTUs relatively consistently, until its canister ultimately drops below its regulated level. A stove with a low-quality regulator will start off impressively, then quickly plummet in performance, offering neither consistency nor efficiency. Of course, there’s far more that goes into the design of a stove that impacts its overall performance. 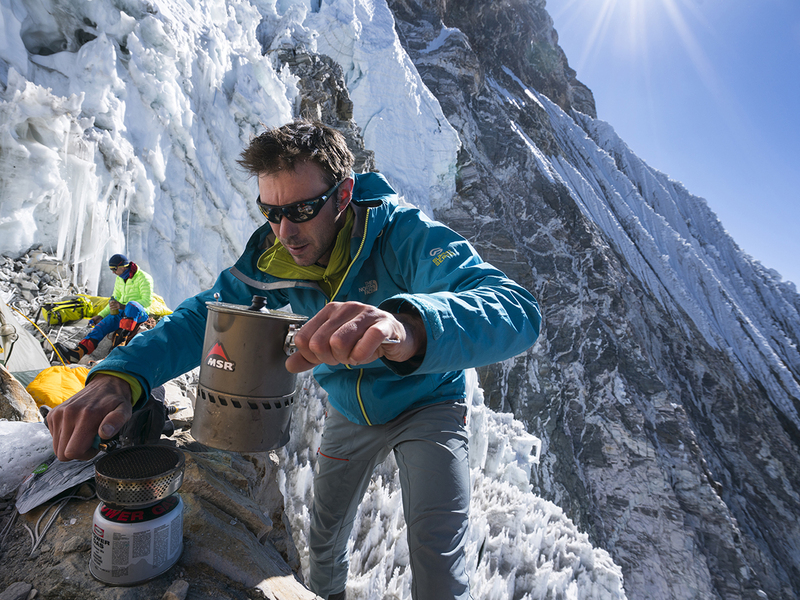 But in challenging conditions, a good pressure-regulated stove will be more dependable and consistently faster than conventional stoves—so you can make that hot cup of coffee, and get on with a day roaming the alpine. Originally published on July 28th, 2016.